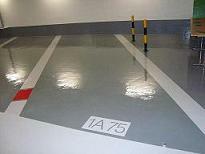 Dubai, UAE – Speciality Engineering Chemicals(SpEC), a leading construction chemical manufacturer, announced the introduction of a new polyurethane car park decking system, SpECtop CPD System. SpECtop CPD System is a multi-layered polyurethane car park decking system with crack bridging properties for car park decks, ramps and heavy wear areas. SpECtop CPD System is designed to meet contemporary requirements for modern car park environments, helping to enhance visual appearance, improve light reflectivity, reduce noise from tyre squeal and prevent water ingress into concrete structures. In addition, SpECtop CPD System is a solvent-free, eco-friendly product with low VOC content. It is available in a wide-range of attractive colours and finishes with the option to create vivid demarcation lines and signage, which help to regulate traffic movement and leave a welcoming feeling for vehicle users. SpECtop CPD System complements the existing range of products for concrete repair, flooring, coatings, waterproofing, joint sealants, grouts and adhesives. It is available through SpEC’s network of distributors and specialized approved applicators in over 20 countries in the Middle East, South East Asia and Africa”.